I am always very surprised when I read a lot of positives reviews about a product and I have had a completely different experience. 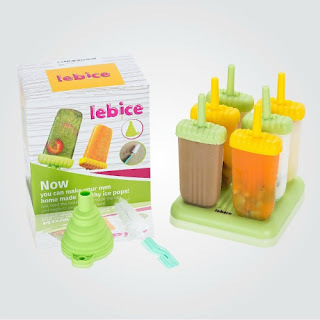 These Lebice Popsicle molds are absolutely no better than any others that I have tried and, in fact, they are worse! The first clue that a product isn’t up to par is when that product (or company) compares themselves to another brand. Directly on the Lebice Popsicle Molds Amazon page, this company states “Tupperware Quality”. If a product is good, there is no need to compare it to any other brand -- except that the word “Tupperware” may make a product rank higher is searches. After one use, the inner plastic handles on two of the Lebice Popsicle molds broke and the casing on one cracked. I know that it isn’t me since my freezer is a standard household freezer and I have no problems with other items. As I always say when I have not had a good experience with a product, this is solely my experience and you may have a better one. The Lebice Popsicle Molds sell for $11.50 on Amazon.